Tensile Shade Structure a division of Global Agencies & Marketing, has proudly completed successfully over 300 of tensile structure projects in UAE and abroad. Global Agencies & Marketing tensioned membrane structures are innovative technology, with our logistical local manufacturing design facilities, fabrication and installation of all kinds of membranes, PVC, PTFE, HDPE and ETFE for all kinds of permanent tent structures. Shade Art LLC is a sister company of Global Agencies & Marketing and specialized in projects of permanent tensile membrane structures. 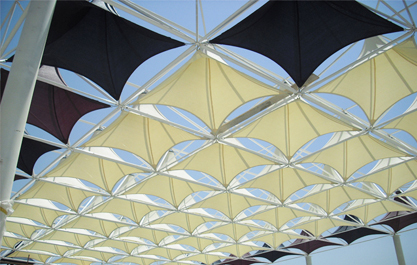 Shade Art LLC is offering professional services to Consultants, Construction companies & Individual clients and has a wide range of experience in Design, Engineering, Manufacturing and Installation of Tensile Shade Structures in UAE and abroad and have so far completed more than 400 projects. Type of Projects: Mall Shades, Roof Canopies, Car Park Shades, Stadium Shades, School Courtyard, Agriculture Shades, Architectural Shades, Swimming Pool Shades, Children’s Play Area Shades, Theme Park Shades, etc.